Why Is Australia So Attractive To Millionaire Immigrants? We all know somebody who moved to Australia to take advantage of fabulous weather and beautiful beaches, but what is attracting so many millionaires? Conventionally, much larger or wealthier countries have been more attractive for millionaire migrants, but Australia welcomed 11,000 during the year 2016, putting them in the top spot. The report was carried out by New World Wealth, who are a South African market research group. In 2016 there were 82,000 millionaire migrants. Of this 82,000, 10,000 arrived in the US and 8,000 in UK. 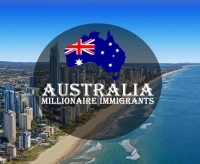 So what is driving the trend for millionaires to migrate live down under? Of course at this point it has become popular to blame Donald Trump, but the numbers were collated long before his presidency began and his decision to place travel restrictions on some Muslim countries. In 2012 Australia launched a visa program, specifically set up to attract wealthy investors. The initiative saw over $3.8billion come into the economy. Much of this wealth came from China. According to the report, wealthy migrants also look for places which are considered to offer good personal safety and education. Australia’s close proximity to China is also likely to be a factor.